You are currently browsing articles tagged TGV ticket. TGV Pro train ticket exchange & refund policies are unique. I’ll attempt to explain the conditions of sale for these business class TGV train tickets below. The main difference between Pro (Business) and Loisir (Leisure or Economy or other types of) tickets is their refund/exchange policy. TGV Pro tickets are exchangeable for another TGV ticket on any other TGV train route, without exchange fee, up until your train leaves. You must pay any differences in fares, if applicable. TGV Pro ticket holders, from one hour before your scheduled departure to one hour after your scheduled departure, may take trains on the same route, without exchanging your ticket. This does not guarantee you a seat! 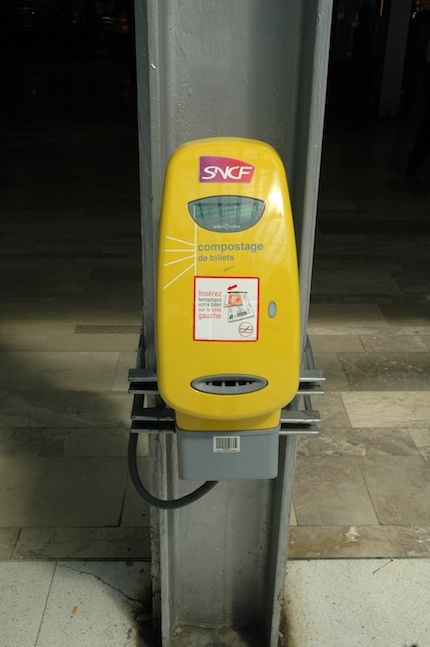 If you have time, you should visit a automated ticket vending/exchange machine (Yellow for any type of TGV ticket, Purple for Pro TGV tickets) to officially exchange your ticket and reserve a seat. TGV Pro tickets are fully refundable up until the time of departure of your scheduled train, free of cancellation fees. After your scheduled train departs and up until 60 days afterwards, you will lose 50% of your ticket value for any refund or exchange of the ticket. After 60 days, an unused TGV Pro ticket is worthless. Exchanging/Refunding tickets using automated machines or ticket counters in any major train station is free of charge. You may cancel/refund a TGV Pro ticket by telephone at any time up until 60 days after scheduled departure. To speak to a SNCF travel agent by phone to exchange/refund tickets call 08 92 35 35 01 when in France (0,34€/min). If you are unsure of your travel plans in terms of schedule, it may make sense to purchase TGV Pro train tickets. Loisir tickets are exchangeable, free of service charge, up until the night before the day of travel. On the day of travel, Loisir TGV tickets are subject to a 10€ exchange/refund fee (plus difference in fares if applicable). After the departure of your scheduled train, Loisir tickets are worthless.